So that’s what funereal Handmaid’s garb looks like. Earlier this season on The Handmaid’s Tale, we all attended a mass wedding in Gilead. This week, on an episode simply titled “After,” we witness a mass funeral. But, praise be, somehow this isn’t yet another wall-to-wall excruciatingly depressing episode! Of course, there’s still plenty of awful, awful stuff to get through. As you might expect, the various factions within the community are all dealing with the fallout of last week’s suicide bombing (triggered by the tongue-less Ofglen) at the fancy new Handmaid intake/training/torture center. 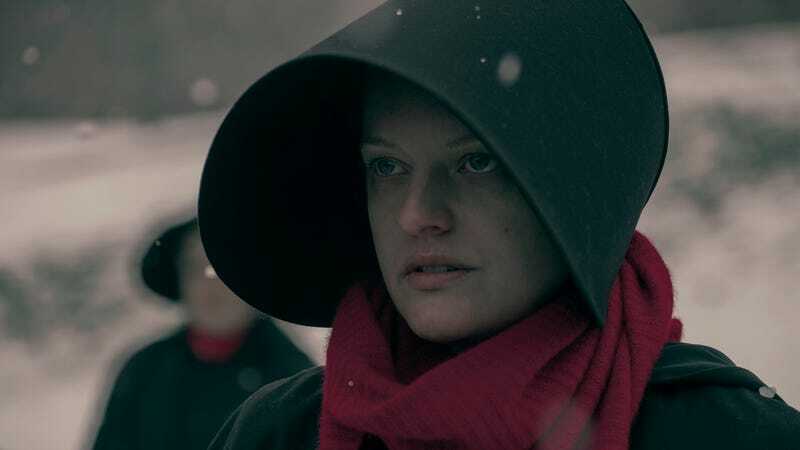 Apparently, all those Handmaids who were paraded out for the opening event didn’t escape the blast, because there are around two dozen coffins arranged in the snowy field, and Aunt Lydia leading just as many Handmaids—dramatically dressed in black, with red scarves over their faces—in paying their respects. “I heard 26 Commanders and 31 of us,” reports Alma (a.k.a. Ofrobert, the chatty Handmaid who’s so often privy to the latest news) as the women are ferried back to their households. A peek through the van windows reveals a body hanging at nearly every house... naturally, the Eyes have been batting cleanup and spreading as much horror as possible in the event’s aftermath. Commander Waterford is not among the fallen, though he’s been badly wounded, but the blast claimed big cheese Commander Pryce (the guy who drew Nick into the fold, and had promised him a transfer out of the Waterford household). The weaselly Commander Cushing, a character we don’t know too much about, promises the hospital-bound Fred (as Serena Joy, Nick, and Commander Putnam standby) that he’ll find and punish whoever masterminded the bombing. This show has the whole “spooky/beautiful” aesthetic down pat. First up on his interrogation list: Offred. Despite what she says, he knows she wasn’t kidnapped—and that someone helped her while she was hiding. “If your house has been infected with terrorists, I need to know,” he tells her, before heading outside to casually execute some Marthas in the street. June warns Nick that Cushing is on the prowl, and she lets Serena know, too. With Fred incapacitated, there’s no telling what could happen to the Waterford household—word is, every member of Ofglen’s house, including her Commander, was blamed and executed after the attack. News of the bombing has also reached Canada, but initial details are scarce. Luke takes the news amazingly well, but Moira is worried that her best friend is among the fatalities. She’s also got other loved ones on her mind, chiefly her fiancé, Odette. We’ve heard mention of Odette before, but this is the first time we’ve really seen her; turns out the pair met when she was Moira’s doctor during her stint as a surrogate mother. Moira’s search begins in a depressing library filled with binders cataloging the unidentified dead... and, horribly, it ends there, too. Samira Wiley is always great, but her performance in “After,” as she confirms a devastating truth that she kind of knew in her heart all along, is unbelievably heartbreaking. And... who saw this coming? The sudden shortage of Handmaids in Gilead means that the previously-discarded likes of Emily and Janine are being pressed back into service. Janine, of course, excitedly thinks it’s part of God’s plan, but Emily is still too shell-shocked to really react. When June sees her in the market, she makes a point of telling Emily her real name, since she never got to before. It’s a tiny act of resistance that spreads throughout the group of Handmaids, all of whom begin whispering their first names to each other. In an echo of this scene, the names of the women killed in the bombing are read out as part of a memorial in Canada—including the silenced Ofglen, whose real name (Lillie Fuller) was never revealed in Gilead, as June pointed out earlier in the episode. Free life in Canada is still full of Gilead’s pain. The music for The Handmaid’s Tale continues to be on point. In the opening scene in the cemetery, as the Handmaids trudge across the snow, “My Life” by Iris DeMent plays on the soundtrack: “My life, it don’t count for nothing/When I look at this world, I feel so small/My life, it’s only a season/A passing September that no one will recall.” Brrrrr. The decidedly peppier “Venus” by Shocking Blue closes out the episode, as befitting the glimmer of hope we end on. The fact that Moira carried her baby for a British family—we’re specifically told they moved back home after he was born—was a bit of a reassurance. One less poor soul trapped in Gilead to worry about.